Carolina Catholic interviewed Bishop Burbidge and Deacon Michael Burbeck. Deacon Michael (right) will be ordained to the priesthood on Saturday, June 7th. In this show, Carolina Catholic interviews the Bishop and Deacon Burbeck about the deacon’s conversion to Catholicism and his years in the seminary. 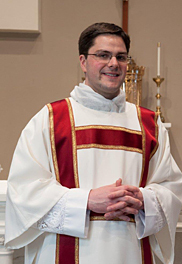 Deacon Burbeck's ordination will be at St. Mark Catholic Church in Wilmington at 10 am on Saturday, June 7th. In addition, there will be a diocesan Holy Hour for Vocations at Saint Therese Parish on Friday, June 6th at 7 pm.